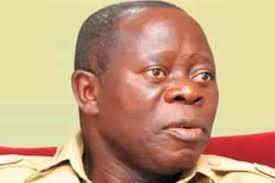 The National Chairman of the All Progressives Congress (APC), Adams Oshiomhole, on Tuesday rejected the results being circulated as the outcome of the Imo governorship primaries, describing it as fake. Mr. Oshiohmole stated this while fielding questions from State House correspondents after a closed-door meeting with President Muhammadu Buhari at the Presidential Villa, Abuja, on Tuesday. Two factions of the APC conducted primaries in Imo. Uche Nwosu, was declared winner of one primary while Hope Uzodinma emerged victorious in the other exercise. The APC chairman also revealed that the party had disbanded the Ahmed Gulak-led Committee that conducted the party’s governorship primaries in Imo. Mr. Oshiohmole, who said he was in the villa to update President Buhari on the developments in the APC, ruled out the possibility of honouring parallel results from states. Mr. Oshiohmole maintained that no matter how highly placed a party member is, he must subject himself to the constitution of the party. It would be recalled that the APC National Working Committee (NWC) panel had also cancelled the Lagos governorship primary election, saying the preparatory process for the election had just been concluded.